Makeblock Orion is an easy-to-use mainboard based on Arduino Uno with improvements for education. It provides eight RJ25 ports to connect to all the other Me series modules with color-labels, can save you from horrible pin-wiring and help you focus on inventor amazing projects. Makeblock Orion supports most of programming software (Arduino / Scratch / AduBlock), and we offer the customized graphical programming software (Scratch for Robot / Makeblock HD App). You can also find Makeblock Base Bracket which is compatible with Orion here. Connect the Makeblock Orion and computer with micro-USB cable first. The first time you use Makeblock Orion ,you need to install the USB interface driver. 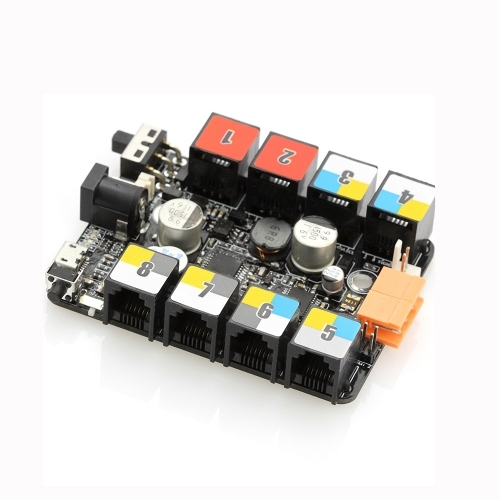 Makeblock Orion support PC and mobile device control.